In a large bowl mix the Bisquick™, milk, butter, and sugar until just combined. Be careful not to over-mix. In a medium sized bowl toss the rhubarb and sugar together and let it sit for 15-20 minutes while juices start to form and sugar dissolves. While rhubarb is macerating, divide the dough into 6 equal parts and drop onto the ungreased cookie sheet. Top with sugar if desired. Bake for 10-12 minutes at 425°F. Let cool while you roast the rhubarb. Turn oven down to 400°F. Place rhubarb in an oven safe pan/skillet. Cover with foil and for 15 minutes. Remove the foil and roast for another 5 minutes. 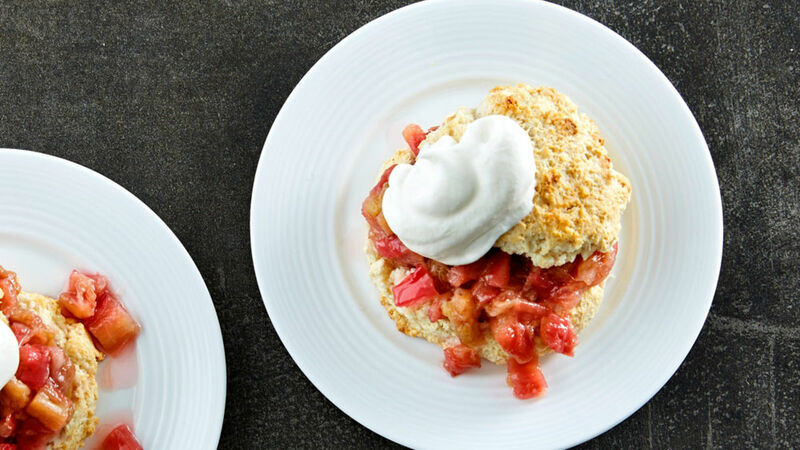 Slice the shortcake in half, fill with rhubarb and whipped cream, and serve.